According to the Puducherry Municipalities Act 1973 the Municipal Administration shall be vested in the Council. The term of the Council consisting of 15 members is of 5 year. The Council is headed by the Chairman elected by the people of Mahe. At present there is no Municipal Council. As such powers of Chairman, Municipal Council has been vested in Regional Administrator, Mahe who acts as Special Officer of Mahe Municipal Council. Overall day to day administration of the Municipality is under the control of Municipal Commissioner. 2. Revenue: Assessment of Property tax (House tax), Levy of Profession tax, Grant of exemption from payment of property tax, Transfer of registry of Ownership in the property tax assessment list, Grant of permission for payment of entertainment tax on the basis of returns in respect of Cinema, Exhibition, Drama, Cable T.V.s and other entertainments, Grant of license for places, public resorts, and entertainment. Grant of permission for erection of bunk-shops on the road side and street margins, Grant of permission for film shooting, Grant of permission for erection of advertisement boards, Display of banners and levy of advertisement tax , Auction of trees and Crops in Municipal land, Allotment of Municipal hall, Municipal maidan and Public park for public functions, Grant of license for pay and use toilets, Leasing out of Municipal land and Buildings and Issue of Door No. Certificates. 3. 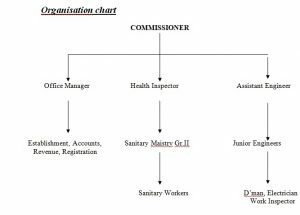 Health & Sanitation :	Grant of Municipal Trade license and permission for industries/factories, shops and other commercial establishment,. Grant of license for rearing of pigs and keeping of pet dogs. . Permission for cutting of road portion/pavement for the purpose of laying of pipe lines, erection of pandals, arches etc. and Solid Waste Management including cleaning of Municipal roads and lanes. 4. Birth, Death & Marriage registration:	Registration of Births, Deaths and Marriages and Issue of Certificates. 6. NULM:	This Municipality is implementing NULM Scheme such as giving individual loan, group loan, revolving fund to SHG’s, training to unemployed for self employment, training for S.H.Gs, issueing identity cards to street vendors etc. Mahe Municipality’s efforts for Swachh Bharat Abhiyan were recognised when India Today group declared Mahe as India’s cleanest district. The award has motivated the Municipal officials and residents of Mahe to further work towards making Mahe a zero waste community.